Normally we don’t talk about health and diet. It’s just too much of a fussy topic with lots of different opinions and such. But today, 4 consecutive people asked us to coach them on health and diet (funny synchronicity), and so, we decided to write this article. Note about the diet and fat: Arielle used to think fat was dangerous and avoided it at all costs for years, but the truth is, this is what we’ve now both found to work well for our bodies. We’ve also been vegan and raw vegan. This method can be used for both vegetarians and vegans. In the end, be true to yourself and be willing to experiment for yourself. May you discover the vibrant energy you deserve. The plan below has proven to work for us. The Bulletproof Diet — It’s brilliant. Praise and Blessings to Dave Asprey for doing the research and experimentation to come to understand on a deep scientific level why some thought to be “healthy” foods affect us negatively, and why high-quality fats are the best fuel ever. Thank goodness for this! (If you’re not familiar with the Bulletproof Diet or Bulletproof Coffee — check out Dave’s blog: https://www.bulletproofexec.com). Why is the bulletproof diet so awesome? The BP diet empowers us with knowledge about which foods are high in unhealthy molds, funguses, toxins and anti-nutrients, and why high quality fats turn out to be a superior source of fuel for the body than carbohydrates. This research is fascinating and makes perfect sense, especially given the rise in obesity epidemic and other health challenges we are seeing spread like wild-fire in the collective (and even in health communities). When we are empowered with this knowledge, we can take right action to create the healthiest, most resilient vessel possible. What’s the catch? If you’re like us, you’re not willing to eat meat, period. A vegetarian yogi lifestyle is your Dharma. That’s ok! Each and every soul needs to decide what type of diet is right for them, on a number of levels. No disrespect to those who choose animal meat in their diets, it’s all good. Each to their own and only you know what’s right for you. However, if you’re reading this article right now, our guess is that you’re vegetarian/vegan and you’re also intrigued by the bulletproof diet. How to do both? A little background: When we first started out eating ‘bulletproof’ foods (a diet high in quality fats and vegetables), we searched online typing in “vegetarian bulletproof”… to come up with nothing. We knew we’d have to hack this one ourselves. How did we do it? After much experimentation and further research, we’ve created a Vegetarian Bulletproof Diet that really works for us. We’re posting this article because we would have loved to find it in our prior web-searching for a Vegetarian Bulletproof solution and wanted to make it easier for you. What have the results been? Incredible. Energy, mental focus and stamina like we’ve never had physically before. We’re on a Mission to be our best. It’s top priority for us to be able to focus with a clear mind as many hours as possible each day. We’re also dedicated to rising between 2-4 am in the morning for meditation, and so figuring out the diet part and hacking our sleep and exercise has been critical for us to live our most empowered and fulfilling life here. YOU have a mission too – that’s why you’re here! That’s why you’re reading this article. Organic chlorella/spirulina (protein): This was the main hack. We mix the powder or tabs in with our heaping bowls of vegetables with several spoonfuls of high quality fats. It tastes wonderful and sustains you for hours. The other protein source that supports us is high quality organic whey protein powder. Early Morning (4 am): Bulletproof Coffee (Upgraded coffee beans with 1-2 tbsp grass-fed butter and 1 tbsp mct oil or brain octane). If you’re a meditator, try this. Best meditation and focus power ever. Breakfast: Varies. Michael will usually have oatmeal & mct oil. Arielle is currently enjoying chia seeds with hemp milk & whey or sunwarrior protein powder. You have to find for yourself what amount of carbohydrates you need to thrive. Lunch: Steamed vegetables with healthy fat (ghee, grass-fed butter or coconut oil), sea salt, chlorella or spirulina. Additions are sometimes sprouted nuts, seeds etc. Snack: (Varies) Decaf upgraded coffee with cacao powder, xylitol and mct oil/ tea/ dark chocolate/ protein bar (ie organic food bar protein, macrobar, no cow bar). Dinner: Repeat… Steamed vegetables (sometimes include sweet potato and carrot more here) with healthy fat (ghee, grass-fed butter or coconut oil) sea salt, chlorella tabs, and sometimes additional toppers like sprouted nuts, tahini etc. Evening: (As needed) Usually just some warm tea :-). 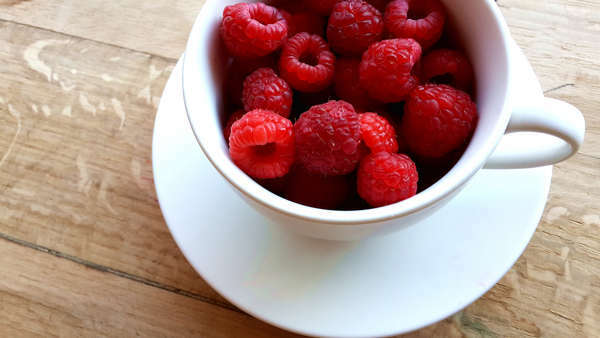 A small bowl of raspberries is another nice treat. Note: This is just a base to give you an idea. Sometimes we get more creative, but to be honest, we’re so focused that it’s not worth it to us to spend too much time on food prep and food decisions. Knowing what we’re going to eat ahead of time helps us to serve thousands of people world wide in awakening spirituality and becoming evolutionary leaders. Note 2: Are you vegan? Here’s what you can do — just substitute the butter and ghee for coconut oil. You may also love to try mct oil. Rather than whey protein powder, fill up on the high-protein chlorella or spirulina. Good luck! Food is awesome, but it only deserves a sliver of our time and focus. That’s why the Bulletproof diet is so awesome — you figure it out once, and you’re good to go. We hope this article helped you. If you’d love to learn more about the bulletproof diet, again, read “The bulletproof diet” book — it’s awesome. Oceans of love and blessings to you on discovering your best nutrition plan! p.s. We found this comment on the bulletproof website from a fellow vegetarian. Perhaps you’ll find what this soul found to work helpful too! Pleeeeease do an update blog on this diet and other meals that you’re eating. It just sort of looks like vegetables, coffee with fat and oatmeal/protein shake which doesn’t seem like a lot of nutrients. options for the protein choices. Any pure ghee is great! Ancient organics is a great one. And we also eat a lot more fruits and vegetables now. We recommend also the books by Anthony Williams, Life Changing Foods and Medical Medium. I also don’t like to eat meat. specially because never ate it regularly so taste is not setup. I lost 16 kg by following BP diet but now after 7 month, I start feeling I may be doing something wrong and weight is also not coming down at all. Will try your menu now. How are you guys feeling now and for how long you are doing it? Hi Raj, we appreciate the bulletproof wisdom, though we now also appreciate plenty more fruits and vegetables. We highly recommend the book Life Changing Foods by Anthony Williams. I have a question? Have you tried pressure cooked beans as a protein to decrease the toxins? • The best way to destroy lectins is to use a pressure cooker.23,24,25 Many swear by the InstaPot,26 a multipurpose pressure cooker. Avoid slow cookers, as they will actually increase lectin content due to the low temperature used. Does reading that change your mind on beans, lentils? Have you tried this on the Bulletproof diet? Good advice! I thought oatmeal and grains were a bit of a no go on the bullet proof diet, as carbs will stop ketosis in the liver, or am I wrong? Hi Arielle and Michael. Thank you for posting this article as I have been enjoying the bulletproof coffee for breakfast but as I’d like to avoid meat have found it hard to find recommendations for vegetarians. I’m not sure when you posted this article but wanted to check in to see how you are going with this diet and if you are still consuming large amounts of fats at each meal. I’d love to hear your progress. Thanks again. Thanks for getting back to me. I’ve recently started eating like you guys i.e lots of steamed vegies with Ghee and loving it. Glad to hear you are still enjoying the Bulletproof diet.